This ASCD Study Guide is designed to enhance your understanding and application of the information contained in Now That's a Good Question! How to Promote Cognitive Rigor Through Classroom Questioning, an ASCD book written by Erik M. Francis and published in July 2016. Most of the questions contained in this study guide are ones you can think about on your own, but you might consider pairing with a colleague or forming a study group with others who have read (or are reading) Now That's a Good Question! How to Promote Cognitive Rigor Through Classroom Questioning. Introduction: What Does a Good Question Do? What do you think makes a question a good question? How do you primarily use questions in your classroom—as a method of instruction, a measure of assessment, or a combination of both? In the introduction, the author identifies five things a good question does. What else do you think a good question does? Review the questions presented in the curriculum or text you are using. How good are those questions? Consider what you know and have learned about good questions as your criteria. Consider the questions that you pose to your students. How good are these questions? As your criteria, use what you know and have learned about what you think a good question does. Consider the questions your students ask. How good are these questions? Consider what you know and have learned about good questions as your criteria. Chapter 1. What Is Questioning for Cognitive Rigor? What is your understanding of academic rigor? What distinguishes higher-order thinking as categorized by Bloom's Revised Taxonomy and by depth of knowledge (DOK) as designated by the levels of Webb's DOK Model? How can you establish and evaluate the cognitive rigor of a learning experience by superimposing these two instructional frameworks? Given the eight kinds of good questions that promote cognitive rigor, what kind of questions do you think are asked most frequently in education? On standardized assessments? What kinds of questions do you think are asked less frequently in education? Review the questions presented in your curriculum or text. Identify the kinds of cognitive rigor questions that are asked most frequently? Less frequently? Not at all? Consider the questions you pose to your students. What kind of cognitive rigor questions do you find yourself asking most frequently? Less frequently? Not at all? Consider the questions your students ask. What kind of cognitive rigor questions do they ask most frequently? Less frequently? Not at all? Chapter 2. What Makes a Good Question Essential? What do you think makes a good question essential? What are the broader ideas and grander themes addressed in the text and topics you are teaching? How can you pose universal essential questions that will engage your students to reflect upon and respond to these ideas and themes? Look at the overarching essential questions in Appendix B. How do these good questions address the core ideas and enduring understandings of a specific academic area or subject? How could you use these good questions as benchmark or interim assessments that measure the depth and extent of student learning in a specific academic area? Look at your grade level standards. How can you develop the performance objective clusters into topical essential questions that will set the instructional focus and serve as the summative assessment for an entire unit of study? How can you develop the performance objectives of the individual standards under the cluster into topical essential questions that will set the instructional focus and serve as formative assessments for daily lessons within the unit? Look at the individual standards that will be addressed in a unit you are teaching. Which one(s) could you rephrase into a driving essential question that will challenge students to think creatively and strategically about what they can create, design, develop, do, plan, or produce? How could you use driving essential questions to encourage students to explore content through project-based learning? Inquiry-based learning? Problem-based learning? Expeditionary learning? Service learning? Chapter 3. How Do Good Factual Questions Set the Foundation for Deeper Learning? How do factual questions help students develop background knowledge and foundational understanding of texts and topics? How could you use factual questions to deepen students' understanding of subject-specific details and terminology? How could you use factual questions to expand vocabulary knowledge and development by defining and describing words and terms in their own words? How could you use factual questions to help students learn to read closely and determine what a text explicitly says? How could you use these questions to help students refer to specific examples and evidence that will support their analyses and arguments? How could you use factual questions to promote informational literacy by teaching students how to acquire and gather the information they need from credible online and print sources? Chapter 4. How Do Good Analytical Questions Deepen Knowledge and Thinking? How do analytical questions promote critical thinking? How can you use analytical questions to deepen student's content knowledge and conceptual understanding of texts and topics? How can you use analytical questions to challenge students to examine and explain how and why concepts and procedures can be used to answer questions? Address problems? Accomplish tasks? Analyze texts or topics? How could you use analytical questions to engage students in deeper and purposeful reading, writing, thinking, and discussion about the ideas, information, and inferences presented in texts and topics? Chapter 5. How Do Good Reflective Questions Expand Knowledge and Thinking? How do reflective questions expand students' knowledge and extend their thinking about texts and topics? How can you use reflective questions to challenge students to demonstrate and communicate strategic knowledge of how and why answers, outcomes, results, and solutions can be attained and explained? How can you use reflective questions to engage students to develop and express deep knowledge about causes, connections, and consequences? How can you use reflective questions to expand students' knowledge and extend their thinking about the relevance of texts and topics across the curriculum and beyond the classroom? Chapter 6. How Do Good Hypothetical Questions Pique Curiosity and Creativity? How do hypothetical questions pique curiosity and promote creativity? What is the difference between a hypothetical question and a hypothesis? How could you use hypothetical questions prompt students to make an educated guess or tentative statement about the possibility or potential for an outcome or result? How could you use hypothetical questions to engage students to make predictions about what may or might happen based upon the evidence provided or patterns presented? How could you use hypothetical questions to prompt students to think critically and creatively about how could they use what they have learned in different scenarios and situations? How could you use hypothetical questions to help students develop and demonstrate metacognitive knowledge about what else or how else can answers, outcomes, and results be attained and explained? Chapter 7. How Good Do Argumentative Questions Address Choices, Claims, and Controversies? How do argumentative questions engage students in decision-making and problem solving? How are argumentative questions "truly multiple choice questions"? Why is the phrasing of an argumentative question so important? How should argumentative questions be phrased according to this chapter? How could you use argumentative questions to encourage students to consider multiple perspectives, points of view, and positions on a text or topic? How could you use argumentative questions to engage students to critique the accuracy and validity of conclusions and contentions? How could you use argumentative questions to challenge students to craft arguments supported by valid reasoning and relevant and sufficient evidence? How could you use argumentative questions to "teach the conflicts" and "learn the controversies"? What are wicked problems? What are impossible projects? How could you use argumentative questions to challenge students to address wicked problems and accomplish impossible projects? Chapter 8. How Do Good Affective Questions Promote Differentiation and Disposition? How do affective questions foster and promote differentiation and individualization? How do affective questions address the affective domain of Bloom's Taxonomy? How could you use affective questions to prompt students to convey what they believe, feel, or think about a specific text or topic? How could you use affective questions to provoke students to express their opinions, perspectives, or thoughts about a particular idea, incident, individual, or issue? How could you use affective questions to challenge students to develop and express self-knowledge and awareness? How could you use affective questions to encourage students to share what they would do or what they will do given certain conditions or contexts? How could you use affective questions to engage students to show how they personally could or how they individually would answer a question, address a problem, or accomplish a task? Chapter 9. How Do Good Personal Questions Motivate Students to Learn? How do personal questions engage students to take interest in and responsibility for their learning? How could you use personal questions to deepen and extend learning experiences about texts and topics? How can personal questions motivate students to want to learn? How could you use personal questions to prompt students to consider what else or what more they want to learn about a text or topic? How could you use personal questions to challenge students to communicate what they have learned about a text or topic to the class? How would you react or respond if a student chose to ask, "Why do I need to learn this?" as their personal question? How would you handle the situation? Chapter 10. How Should Students Address and Respond to Good Questions? How do you think students should address and respond to good questions? Do you think good questions are answered or addressed? How could you use the criteria for assessing student responses as a qualitative measure of student learning? In this chapter, you are given six ways to encourage students to address and respond to good questions. How else could you encourage students to address good questions and give a high-quality response? Which way(s) of encouragement do you think would be most effective in your classroom with your students? The least effective? How can asking, "What do you mean?" prompt and encourage students to elaborate and explain their responses? Why should students paraphrase or transcribe their responses instead of repeating or restating information as presented or provided? How can you teach like an expert? How would this encourage students to provide high-quality responses to good questions? In this chapter, you'll learn about having students "choose their grade" by guiding and encouraging them to provide a more in-depth or insightful response. How would this work in your classroom? How could this shift the responsibility of learning and grading to the student? Now That's a Good Question! 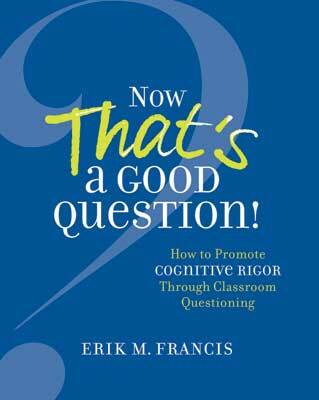 How to Promote Cognitive Rigor Through Classroom Questioning was written by Erik M. Francis. This 170-page, 8" x 10" book (Stock #116004; ISBN-13: 978-1-4166-2075-4) is available from ASCD for $20.95 (ASCD member) or $28.95 (nonmember). Copyright ©2016 by ASCD. To order a copy, call ASCD at 1-800-933-2723 (in Virginia 1-703-578-9600) and press 2 for the Service Center. Or buy the book from ASCD's Online Store.